“Scaps” or “Scapie” as we called her, came to live in our home when she was 10 weeks old. The first sight of her we knew she was going to be our little golden girl. She took to her new home from day 1. Her new home had about 3 acres that really became her’s to enjoy, and enjoy she really did. She was shown the property lines and never left her home. When she got about 5 years old she and her master would go for long walks which they both really enjoyed. She was her master’s best friend and walking partner. She was always with him indoors and outdoors. Wherever you saw one of them, you saw the other. She enjoyed all her toys and always enjoyed Christmas as there were always 2 gifts for her. A new toy and a box of treats, the same went for her birthday. Her favorite was tennis balls and loved playing ball summer or winter. She was always happy to get in the car to go see her friends at Lakes Veterinary & Surgical Center. Everyone loved her there and everyone was her friend. She was always so healthy but we saw that she started to limp a little and that it didn’t go away. So, we took her to see her Dr. Meaghan. She had tests and we were told she bone cancer in her shoulder. One month to the day later, Dr. Meaghan and her assistant Shelley came to our home and put “Scaps” to sleep. That is a day we will never forget. 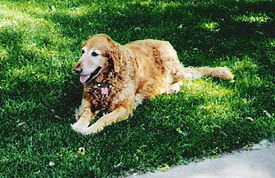 We had her cremated and Shelley told us she would personally bring our golden girl back home to us. We will never forget the loving care that Dr. Meaghan, Shelley and all the girls that work at Lakes Veterinary & Surgical Center gave “Scaps”, Donald and I. Thank you all so very much.